We welcome inquiries about the learning aids we provide free of charge to all individuals working with children who are visually impaired and/or have special needs. 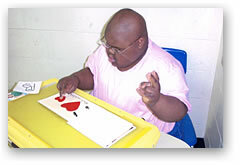 Each of our BASIC BRAILLE CARDS, READINESS BOOKS (including the covers), GAMES and MATH STUDY AIDS is handmade. Please see our Order page to download our Catalog and Order Form. All materials and time are donated and our non-profit Workshop receives no government support except for the international agreements, which allow free postage for teaching materials for the blind. Our operating funds come as donations from Oakmont residents and from those to whom our aids are given. We welcome your donation, which is tax deductible, to aid our efforts!